Opera in three acts, Part One of the trilogy King Arthur by Francis Burdett Money Coutts, Lord Latymer. Cast: Merlin - Carlos Álvarez; King Arthur - Plácido Domingo; Morgan le Fay - Jane Henschel; Nivian - Ana María Martinez; Archbishop of Canterbury - Carlos Chausson; Mordred - Christopher Maltman; with Javier Franco, Felipe Bou, José López Ferrero, Javier Roldán, Ángel Rodríguez. Monks of the Monastery of Alfonso X "El Sabio", Coro Nacional de España, Coro de la Comunidad de Madrid, Orquesta Sinfónica de Madrid, C. José de Eusebio. One of the consequences of reaching saturation point with the standard repertoire is that some very odd, moribund failures get disinterred, more in hope than expectation. Most of these are swiftly reburied, but every now and again a living treasure is unearthed. Albéniz's opera "Merlin" is that rare thing, an unperformed and virtually unknown work of genuine power. I suppose part of the joy comes from the sheer implausibility of the project. The leading Spanish impressionist pianist/composer of the day gets bankrolled by an eccentric English Lord into setting several of his libretti, many dealing with British Myth. These abortive progeny make the stage briefly (if at all) before sinking into merciful oblivion. "What a shame", cry the musicologists, "that the composer of the incomparable 'Iberia' should have had to waste his time on such dross." That is received opinion on the clutch of operas written by Albéniz for his patron, Lord Latymer - Francis Burdett Money Coutts, of the banking family. In truth, with the exception of the one Spanish subject amongst them, Pepita Jiménez, little is known about these operas at all. The history of "Merlin", retold by musicologist and conductor José de Eusebio in his essay for this excellently presented issue, is a fascinating catalogue of mishaps and farce. Before now, the only opportunity the public had to hear the piece was in a cut version performed one night in 1950 by the Junior Football Club (sic.) in a Barcelona cinema. What emerges in this full, well-nourished recording? "Merlin" turns out to be a highly ambitious music drama in three acts, retelling the familiar Arthurian legend up to and including the entombment of Merlin by Nivian (Nimue) in the Cave of Gold. It was intended by Lord Latymer be the first part of a trilogy, so there are many loose ends to the plot, which was to rival "The Ring" in length and complexity. Not much happens, on stage at least. The English text reads like Wagner in one of those quaint turn-of-the-century English translations, with an admixture of Scott's pseudo-Shakespearian diction. Indeed, one of the unexpected pleasures of reviewing this set was the exercise gained from regular visits to the Shorter Oxford to work out what on earth the Noble Lord had been trying to say. The music is appropriately Wagnerian in ambition, style and content, with a web of leitmotifs and thick orchestration to match. If all this sounds impossibly stilted, lumbering and fatuous I'm glad to report that Albéniz triumphs over circumstance, through hard labour and sheer native talent. Vaulting the opaque density of the text - by largely ignoring it - he produced a score which is full, if not absolutely full, of light, passion and real individuality. 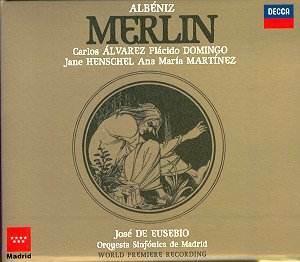 Merlin is an engaging mixture of Gregorian chant, Wagnerian heft, French polish and Spanish impressionism, with a touch of English Romantic thrown in for good measure - another essay by Jacinto Torres points out Albéniz's likely London acquaintance with composers such as Parry and Stanford. The set pieces are exhilarating, notably the drawing of the Sword from the Stone in Act 1, accompanied by a glittering explosion of syncopated trumpet fanfares. The chorus of acclamation at the end of the Act matches this with a thrilling sweep and power that blows any remaining Wagnerian cobwebs away. Despite a lyrical scena for Arthur in which he magnanimously forgives the miscreant rebels, the first half of Act 2 isn't on the same level, with a deal of knightly plotting that sounds like Stanford on Speed. Then, towards the end of the Act, Albéniz hits his true stride. The spotlight swings away from King Arthur towards the hapless Nivian, Saracen Arial to Merlin's machiavellian Prospero. She is desperate for freedom to leave the damps of Britain for the sun and light of her native Mediterranean, a desire perhaps uncomfortably close to the composer's own. At all events Nivian and her magical, Moorish world drew from Albéniz a stream of fine music in his most personal impressionist style, making memorable use of alhambrismo, the chromatic recreation of Arabic music so popular in contemporary Spanish orchestral works such as Bretón's "En la Alhambra" and Chapí's "Los Gnomos de la Alhambra". Act 3 begins with a delicately evocative Prelude and choral song in praise of the May morning, capped by the sensual dance of the Moorish nymphs - quintessentially Spanish, pungently spiced in harmony and orchestration, the highlight of the whole work. Merlin's seduction, and Nivian's closing jubilation as she sets off for her beloved South, are at the same high level of inspiration. Not everything about Merlin succeeds so well. Albéniz's theatrical inexperience and lack of interaction with Latymer's convoluted doggerel produces, Nivian apart, a deck of cardboard characters who come to life but spasmodically. The vocal lines are imaginative and taxing, but resolutely unwedded to the words. There is a cultural schizophrenia about the end product which will always mitigate against its dramatic viability. An impressive cast do what they can to flesh the figures out. Domingo sounds astoundingly youthful as Arthur, in virile voice apart from an occasional hint of wear above the stave. The young Álvarez's saturnine baritone sounds mature and generally steady enough for the title role, and he makes what he can of the magician's rather piecemeal musical opportunities. Both singers have an acceptable command of sung English - what they can have made of some of it, goodness only knows! As Morgan le Fay, presiding evil genius of the plot, American soprano Jane Henschel makes much more of the text than her Spanish colleagues. Henschel's vocal contribution is generous in quantity if sometimes spreading in quality. Ana María Martinez makes a sympathetic Nivian, singing with unaffected purity throughout. Their scene together at the end of Act 2 as Morgan goads the Saracen girl into action against her master-tormentor is mesmeric, dramatically original and musically intense. For conductor/musicologist José de Eusebio this was clearly a labour of love, and he above all is the hero of the hour. The scrupulous detail of his team's preparation is impressive, even down to having the Monks' Choir perform their Chant in correct mediaeval English dog-Latin. They even provide a posse of eight counter-tenors for a semi-chorus of gnomes lasting all of 50 seconds! Such careful attention shows proper respect to a work with no performing history, but Eusebio's triumph is his ability to inspire the large cast, chorus and orchestra to sound so completely at ease in an unfamiliar musical and linguistic milieu. The performance has a powerful momentum which succeeds in restoring the score to life, single-handedly bringing about a revaluation of Albéniz's stature as an opera composer. At last, warts and all, Merlin lives and breathes - magnificently. This is an amazing and unexpected revival, a totally unknown English-language opera, beautifully sung and presented, that will, I suspect, come as a complete surprise to most opera lovers. But it has to be said that, with its strong Wagnerian inheritance, you would never guess most of it to be by Albéniz if you did not know. There were many operas written in this turn-of-the-century idiom, but few which generate such a consistent or infectious momentum. Despite the popularity of Arthurian themes for novelists, there are comparatively few Arthurian operas. After Purcell's King Arthur we need to come to the nineteenth and early twentieth centuries for later examples, many by British composers. Parry's unorchestrated Guenever of 1885-6 was repudiated by the composer, but an aria orchestrated by Jeremy Dibble hinted at a virile score and memorable invention when broadcast in 1995. Edward Naylor's Arthur the King and Rutland Boughton's cycle The Round Table are completely forgotten. More recently Ian Hamilton's Lancelot made a brief appearance in 1985 noticed by few who were not at the performance and quickly vanished. It was the dramatic cantata The Legend of King Arthur by the American composer Elinor Remick Warren which alerted me to the real possibilities of an Arthurian theme, for me one of the highpoints of the 1995 Three Choirs Festival, but despite a packed cathedral and a warm reception made little wider impact. Probably the best known Arthurian opera is Chausson's Le Roi Arthus, though possibly the most noted predecessor to Albéniz's score was Goldmark's Merlin. There was also another Merlin, by the completely forgotten Philippe Bartholomé Rüfer, seen in Berlin in 1887. In fact Albeniz's opera was intended as the first of a cycle of three operas, and the pacing of the story, which really does not end satisfactorily, reflects this role as the start of something larger. It was to be followed by Lancelot, which was begun but never finished, and Guenevere of which we have a libretto but no music. At the turn of the century there was quite a tradition of rich financiers with artistic inclinations funding their chosen composer - perhaps the best known being Lord Howard de Walden whose gloomy libretti based on Welsh legends he financed Holbrooke to set. But Albéniz preceded them, albeit by only a few years. Albéniz lived in London for some four years in the 1890s where he met Francis B Money-Coutts, the heir to the Coutts banking empire, who financed him in return for his setting a series of Money-Coutts's libretti - indeed there was a formal contract. There were three of these operas: Henry Clifford (1893-5), Pepita Jiménez (1895) and Merlin, whose libretto was published in 1897 and was composed 1897-1902. The Prelude was given several performances when Albéniz was still writing the opera, but otherwise it has only had three hearings before this recording. A fully sung piano run-through in 1905, a truncated revival in Spanish in 1950 and its concert premiere, in English, in 1998 which lead on the present recording. The booklet is fascinating for the blow by blow account of how the score was reassembled and researched for the revival - it is wonderful that we still have such skilful enthusiasts willing to devote the thousands of hours and the not inconsiderable cost that go into such revivals. It was certainly worth the effort on this occasion. The first act tells the familiar story of the boy Arthur pulling the sword from the stone, thus identifying himself as the chosen King, and ending with Morgan le Fay, Mordred and their followers singing their defiance at this turn of events, before all sing a patriotic verse to end the act on a triumphant note. With its use of plainsong at appropriate moments in the church scenes it has been hailed as pioneering, but in fact is a vigorous and musically inventive act which succeeds because of its taught construction and the headlong momentum which never lets up. The second act opens at Tintagel Castle. Arthur tells Merlin of his love for Guenevere, but Merlin recognises Guenever as a threat, and he is determined to discredit her. Morgan, Mordred and Sir Pellinore are brought in, the defeated in their insurrection against Arthur. He pardons them, but Morgan le Fay is already plotting again and has realised she has to eliminate Merlin to reach the King. In the third Act we stray further from the well-known story. Arthur sings of may time and Guenevere, and Merlin determines to intervene. But first (like Wotan) Merlin needs gold and plans to take it from the gnomes. To achieve this he calls Nivian and her companions to dance. Presumably it was the demands of the theatre at that time that demanded dances of Saracens and gnomes in the third act, and their music take us much nearer to the Albéniz of Iberia and an idiom we all know. Nivian then dances seductively for Merlin who is aroused and she persuades him to let her hold his magic wand (no guffaws in the back row, please). Naïvely she does not realise she now holds all Merlin's power as he enters the cave to raid the gnomes' gold. Nivian seeking freedom from the gnomes and Merlin unwittingly invokes Merlin's power and seals the cave, and Morgan le Fay reflects on the power of innocence to undo the most powerful magic. This rather contrived end gave Albéniz the opportunity for some dramatic music, but it is the least convincing part of the opera. The weakness of the work is, as may be expected, Money-Coutts's libretto. Not in structure or unnecessary wordiness, indeed the plot moves with commendable swiftness, by an author who seems au fait with the demands of the stage, but because of its arcane language. This includes such delights as "be forgotten the scathe and domage/each of us twain has done the other!" and "Orgulous boys with spite so dreadly/dare to say what they list to say!" Merlin is sung in the original English, with a strong cast. Domingo is vocally tremendous as King Arthur, projecting his rôle and crowning the ensemble in truly heroic style. His English is remarkably good, but his slight accent is compounded by all the other slight accents from most of the cast, which reinforce the antique words when they would be best played down. Virile choral singing and strong orchestral playing, vivdly and realistically caught, all add to the success of this revival. In short, a triumph. The 125-page booklet is an exemplary production, itself a useful contribution to the literature of a work that has been accorded little scholarly coverage. We are given the text in English, French and Spanish, and this is one of those operas where it is essential to have the libretto because some of it is difficult to follow, especially towards the end of the third act. Writing in the booklet to champion the music, the conductor, José De Eusebio announces baldly "Albéniz's opera Merlin is destined to become part of the major international operatic repertoire". His is a passionate and committed advocacy. Well Merlin certainly goes with a swing and there are few musical longeurs. But whether so old fashioned a plot would find favour on the international stage today is difficult to say, though I must say I would love to see it. It is the perfect CD opera, and especially on the first disc this is a recording one will constantly dip into. Do try it.